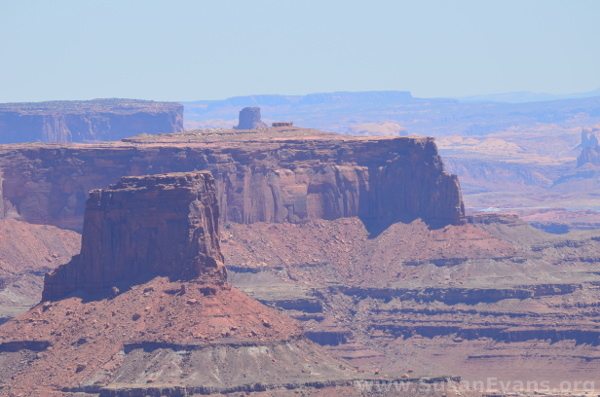 When our family arrived at the top of one of the overlooks at Canyonlands National Park in Utah, we could see an immense canyon with bizarre red outcroppings jutting out of the ground. 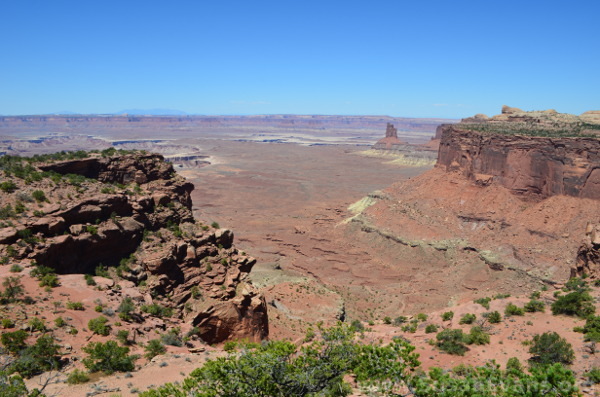 The summer heat penetrated our skin as we took in the beautiful panorama. 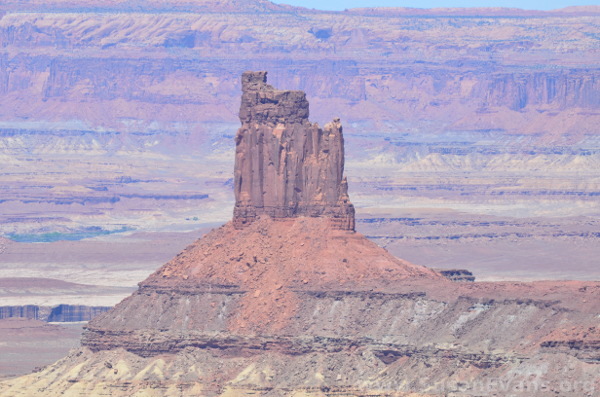 If you ever wondered what a butte looked like, here is a gorgeous picture of one. It seems strange that erosion wouldn’t have flattened the structure by now, since the surrounding area is so much lower. It looks unreal. This is an area known as “The Needles,” because the rocks jut up in needle-like structures, standing up like an army in the middle of an empty battlefield. 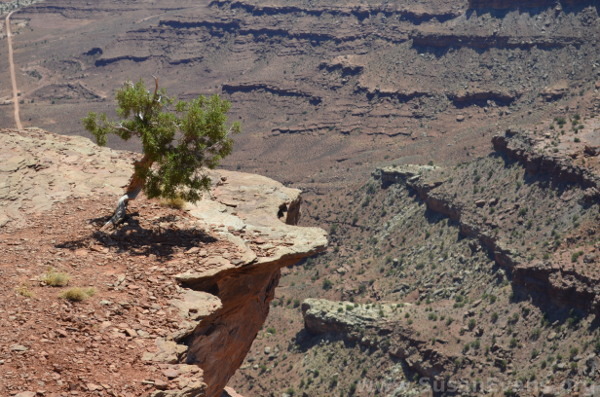 The edge of the cliff reminds me of cartoons of Wile E Coyote, who chased Roadrunner through deserts like this, only to find himself falling off the cliff–often with an anvil rather than a parachute. I liked how the tree grew near the edge, allowing people to sit in the shade to enjoy the view. 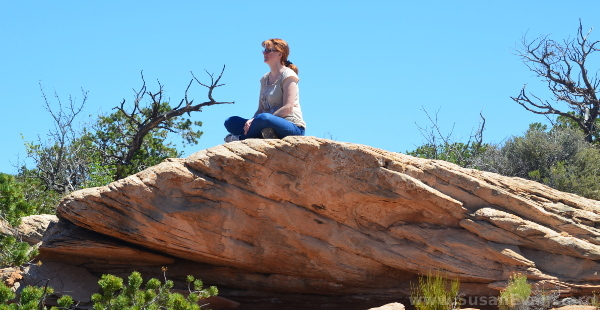 Here I am sitting on a rock in the sun, from a different vantage point. (I would be paying for it later through a bright red suntan.) 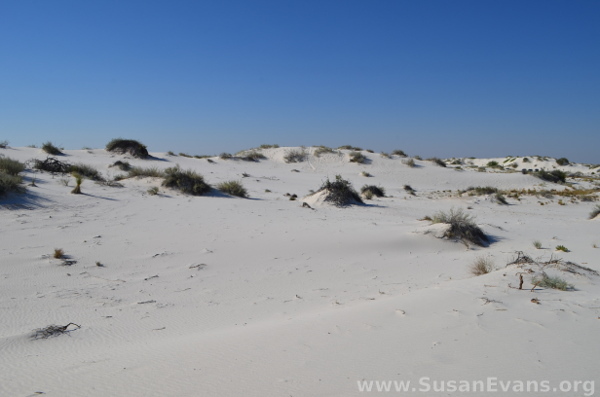 I slid the red dirt between my fingers and marveled at how different it was from the stark white sand we saw at White Sands National Park earlier in the week. My husband Alan is pictured here in front of a super interesting formation called “Island in the Sky.” From up above in a helicopter, you would see a blob like an amoeba carved into the ground like a ginormous cookie cutter. A river runs through the area. 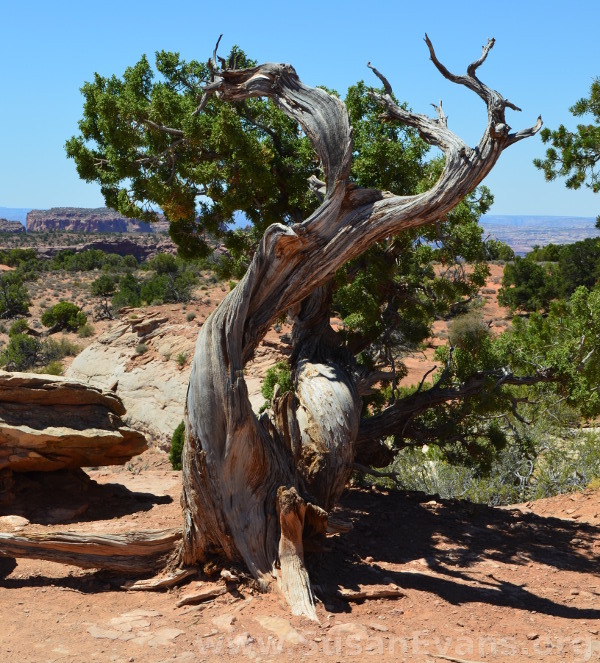 Gnarly trees like this one grow in this desert area, giving a small amount of shade from the intense heat. 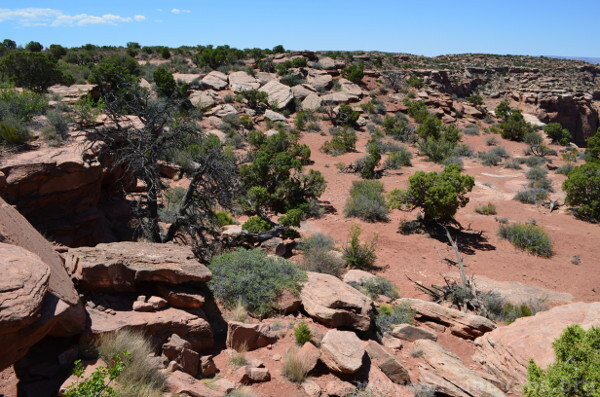 Most of the plants are lower to the ground, and they are sparser the further down the canyon you go–except for the river area, where you will find strips of green along the water. You’ve really got to see this in person to get the full magnitude of the giant-ness of everything. 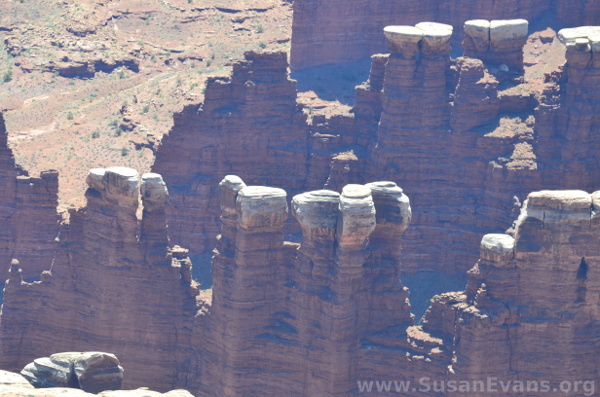 Looking down from different angles at the beautiful rock formations is truly a breathtaking experience! 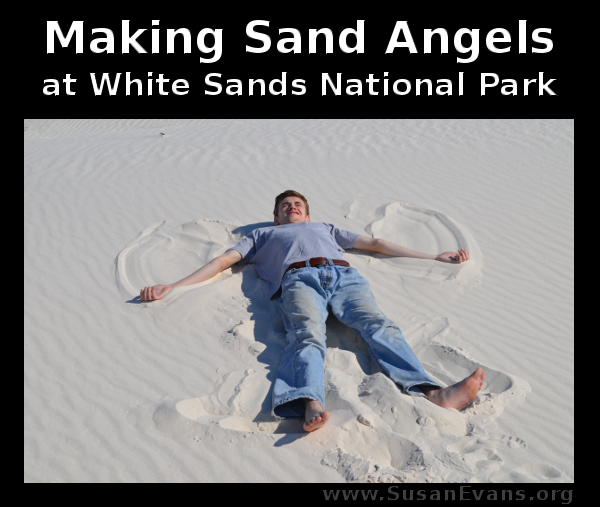 I laughed when I saw my son making sand angels when we visited White Sands National Park in New Mexico. 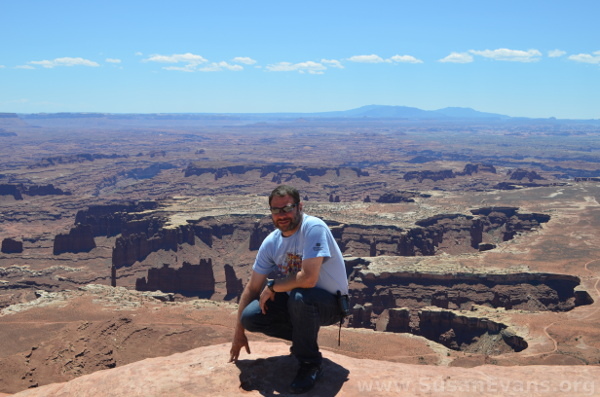 We were on our way to Canyonlands National Park, so we only spent about an hour playing in the sand, which was ultra fine and starkly white. 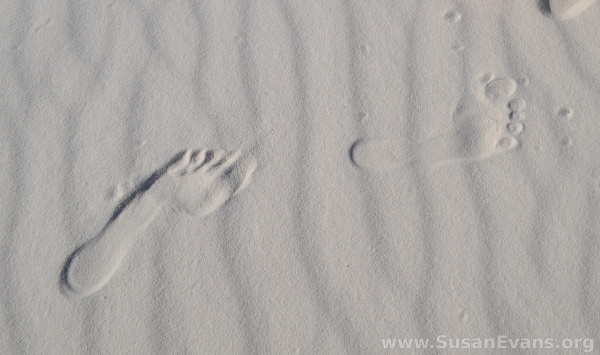 We took off our shoes and left footprints in the sand. The wind made ripples that made the sand look other-worldly. I felt like I was walking on the moon. 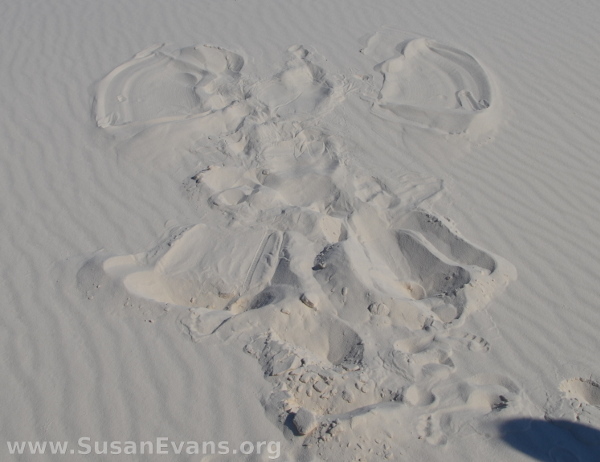 My oldest son lay down and flapped his arms up and down in the sand to create a sand angel. He must have felt like the white sand resembled snow. Apparently the sand is made of white gypsum. 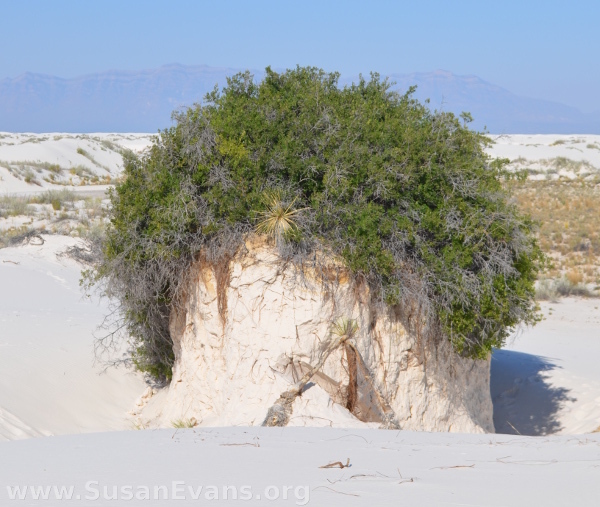 This national park is the largest deposit of gypsum sand in the world. Not very much grows in this sand; it’s kind of like a desert. In fact, there are lizards and other desert animals hiding in the dry shrubs. It definitely looks like another world. It’s silent except for the wind blowing on the sand. 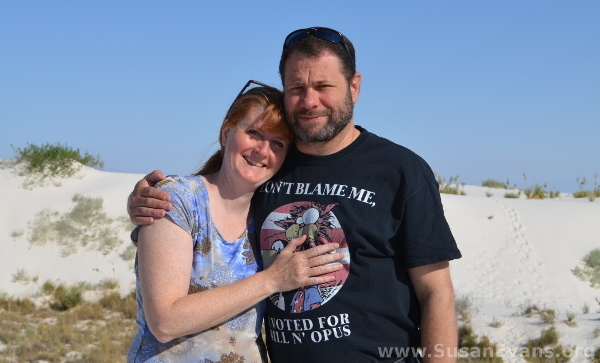 Here’s a picture with my husband at White Sands National Park. Here is a weird shrub on an outcropping. It looks like an enormous chia pet. You can see how bizzare this place looks. 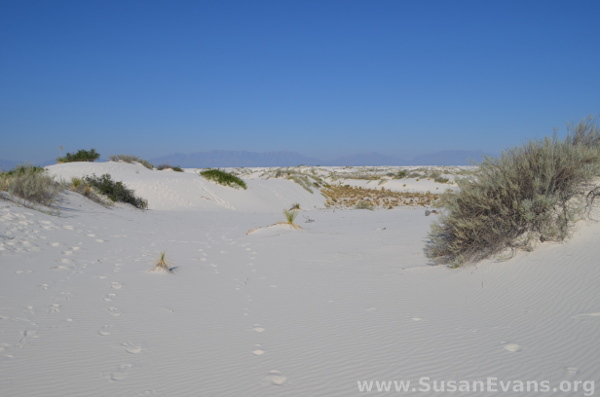 Its unusual white sand makes it a unique place to visit, and my kids loved it! 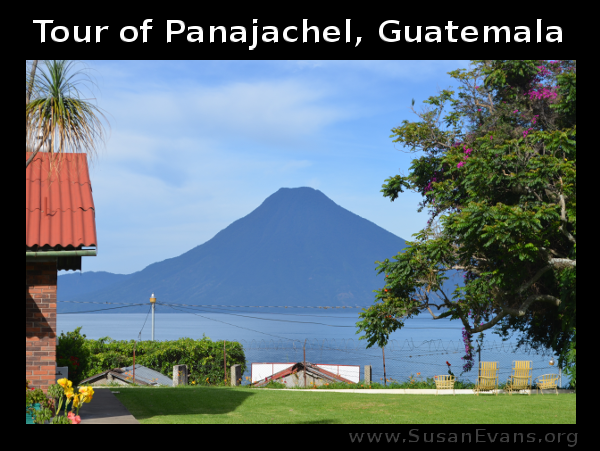 Another highlight of our trip was our tour of Panajachel, Guatemala. Growing up as a missionary kid, my family used to go to Panajachel once or twice a year to rest. The mission had a property that could be used for missionaries and other Christian workers. I loved this time we had as a family–without television and phones–to connect through conversation and card games. 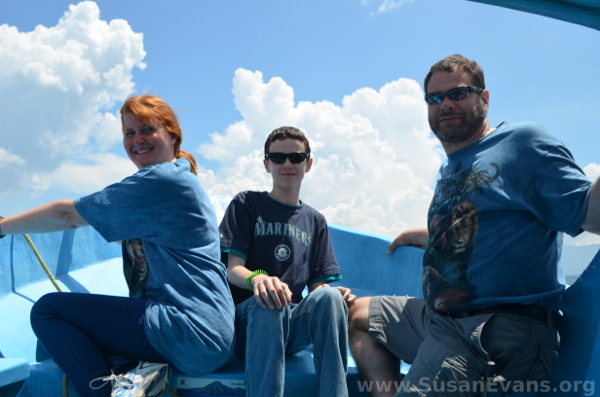 We ended up going on another boat ride to Santiago, which is right across the lake. This was the only lake town I ever visited as a child, so it was fun to go on the longer boat ride a few days before with my friend Christie’s family. Each town is unique and beautiful in its own way. The lake reflects the blue of the sky, and it is tranquil until the late afternoon winds. As a child, I would sit on an inner tube, waiting for a boat to come by and make some waves. Through the clear water on the shore you can see pebbles and rocks, which is why we wore flip-flops when entering the water. 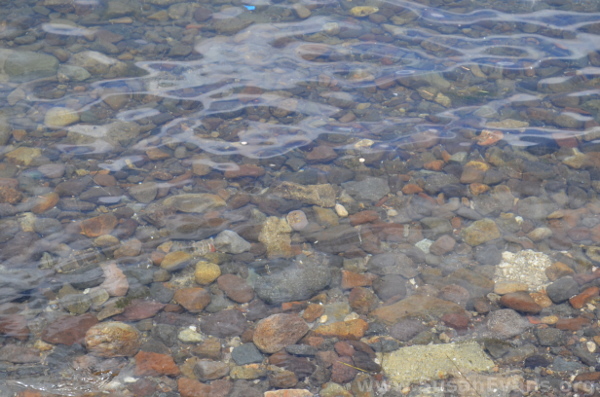 When I was a kid, I would collect different-colored rocks and seashells along the shore. 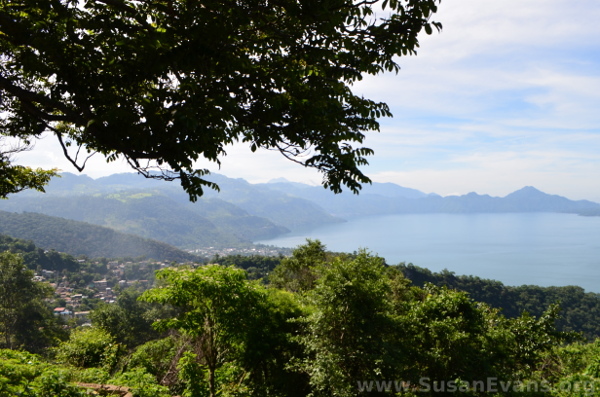 We walked through Panajachel and realized that the town has grown in size and become more commercial, especially along the lake shore. It used to be that there were no shops on the shore of the lake. Now there are several rows of shops and restaurants crammed along the entire length of the shore, sometimes on stilts. 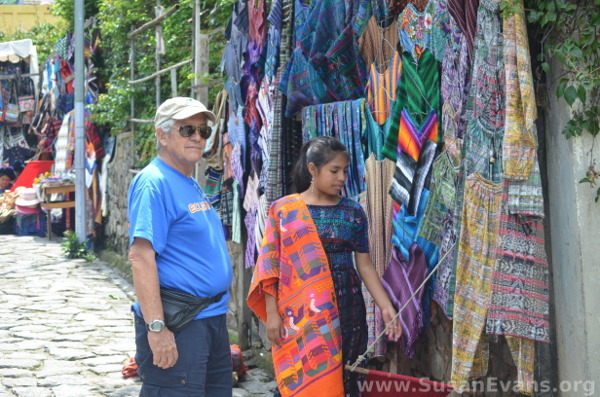 Each of the places we stopped had many booths filled with typical Guatemalan cloth and souvenirs. 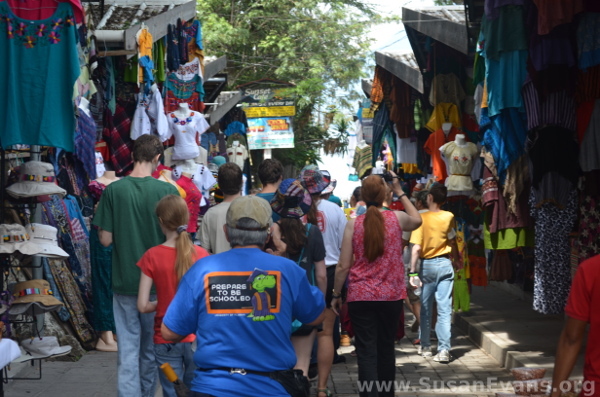 Shopping at Guatemalan markets is fun because you are able to bargain with them about the price. If you have white skin, people think you are rich, so they start the price higher than what they are expecting you to pay. If you think the price is too much, you can offer a more reasonable price. When leaving Panajachel, you must stop along the mountain and take pictures because the natural beauty of the area is breathtaking! 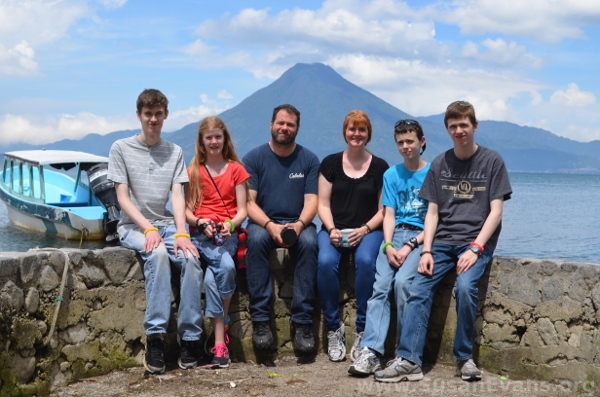 This was a wonderful conclusion to our Guatemala Adventure! 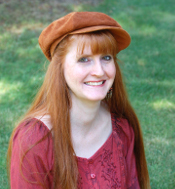 To follow my MK posts and musings, like my Missionary Kid page. And if you love to read about missionary kids, buy the book! 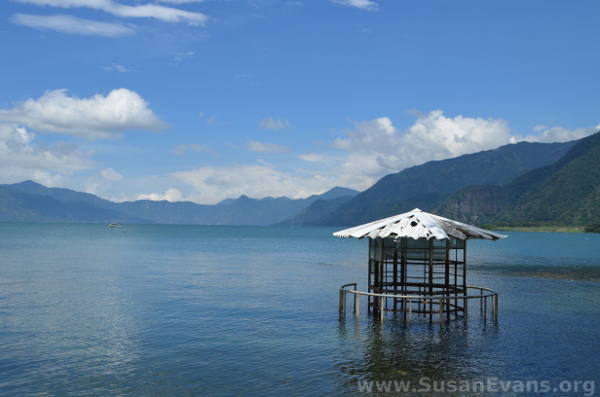 While staying at Panajachel, we went on a Lake Atitlán boat ride, which was beautiful! 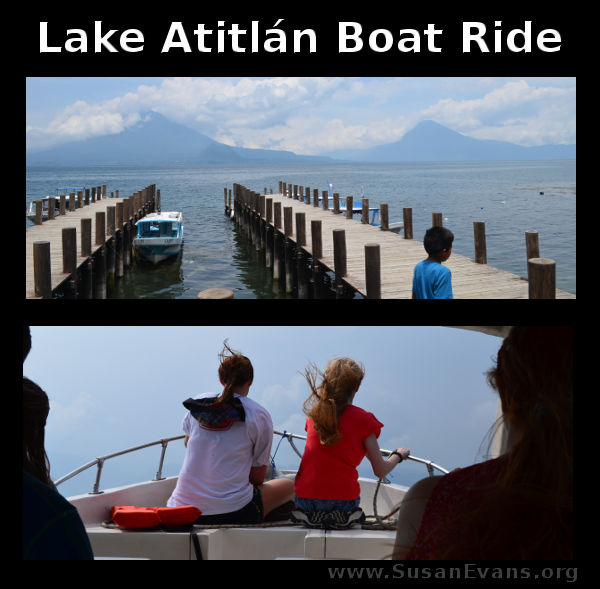 As we buzzed around the lake looking at the majestic volcanoes, we stopped at various villages along the shores of Lake Atitlán. 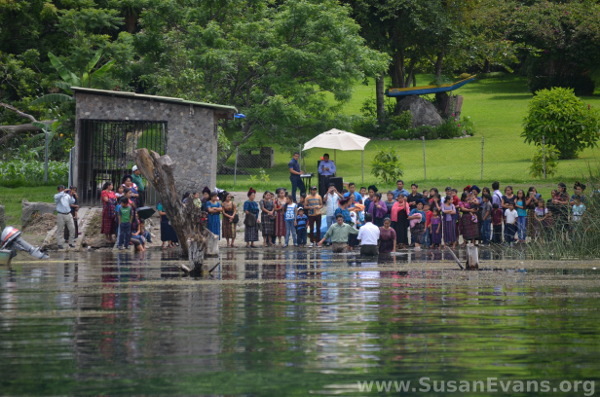 When we arrived at our fist destination of Santa Catalina, we saw a baptism taking place! The people were singing a Christian song at the service they were having down by the water. Our boat man waited for us as we got out of the boat and spent about half an hour at this location. We watched women weaving cloth right in front of our eyes. 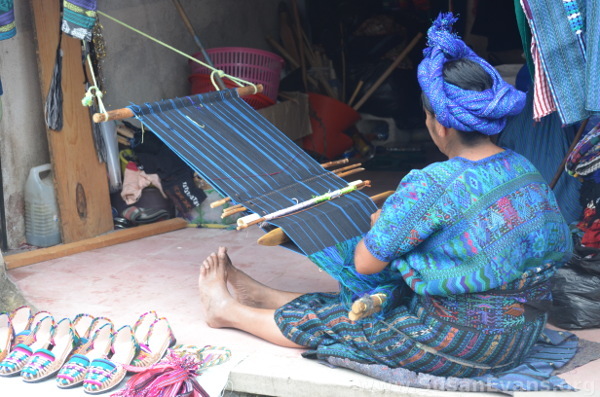 The women have been weaving this cloth generation after generation, and each tribe has unique colors to wear. The wall hangings are beautiful and often have “Guatemala” woven into them. 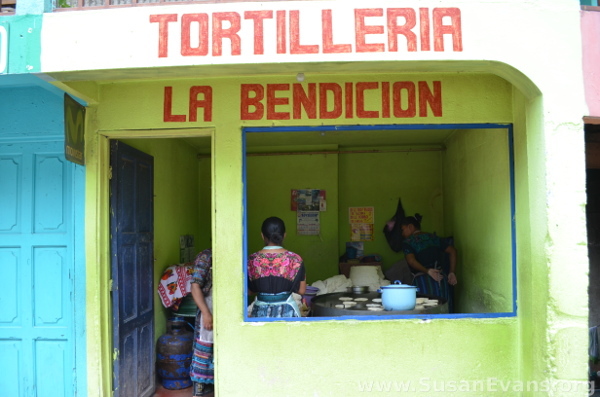 We stopped and watched women making corn tortillas from scratch, frying them on a large flat skillet the size of a table. People would come here to buy their tortillas. Each town that we visited had at least one church. San Antonio had two churches side-by-side in the whitewashed Spanish style of architecture. Most of the beautiful churches are Catholic, as the Evangelical churches tend to be simpler buildings. 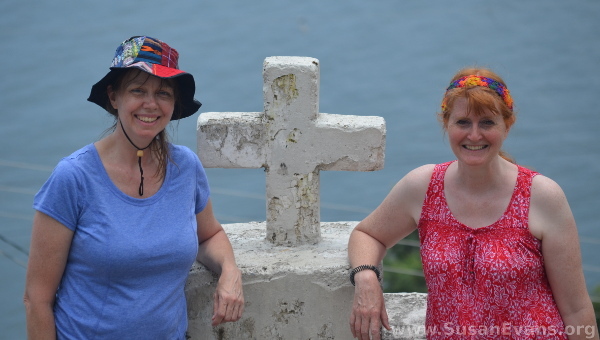 As you can see in the video, at San Antonio we climbed up a hill and down a narrow alleyway where roosters crowed. You can see the destitute poverty of the area as houses are crowded up against each other. At the third stop, the rain fell heavily (since it was rainy season), and we ended up eating lunch. A couple of hours later when the lightning and thunder stopped, the boatman was allowed to take us back to Panajachel. Stay tuned for out next installment of our Guatemala Adventure series, and like our MK page to not miss any posts!